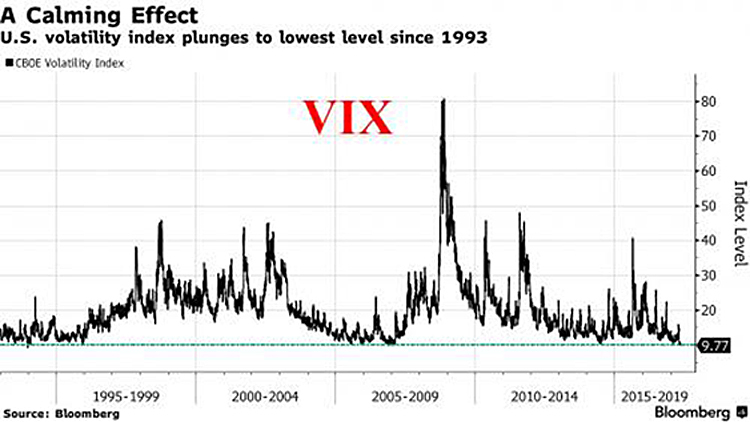 The big story in the markets is record low volatility, with the VIX dropping to a level not seen since 1993 while shares are trading at record levels. There have only been three moves in the S&Ps of 1% or more since the start of the year; based on the norm, there would have been 19. Investors have never been more complacent, according to sentiment measures. It is just too quiet, disturbingly quiet, with markets sliding up every day, leaving little gaps in the morning and never correcting. The NASDAQ has left at least 44 unfilled gaps since the bull market began in March 2009. In the old days, we used to say that gaps are almost always filled, sooner or later. This is definitely later. A chart of the QQQs over the past year and a half is a stunner: 16 open gaps. None have been filled; none have ever even bothered to revisit their trading range. 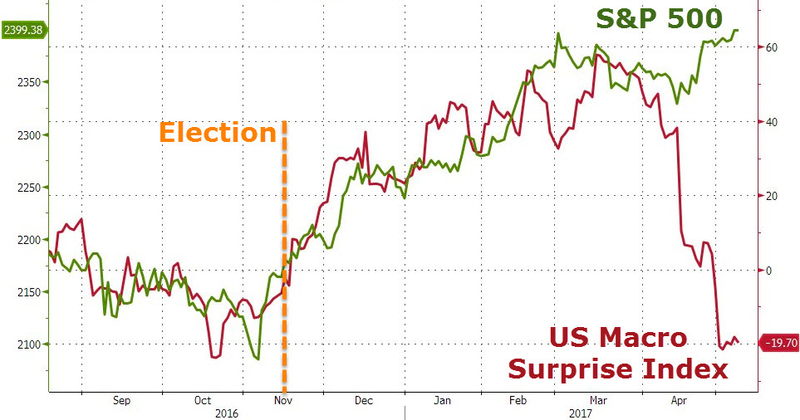 Ever since the February, 2016 correction (the last correction ever? ), subsequent ongoing record global central bank intervention in markets has opened gaps, driven markets up and reduced volatility. Massive liquidity issues in Chinese wealth management products, commodities crashing, oil plunging, US macro data disappointing, earnings misses and Buffett dumping Big Blue—and yet the Dow just had its quietest eight days since 1952! CitiBank’s US Macro data has negatively surprised for seven straight weeks, dropping to its weakest level since October. The Trump effect has faded but markets still soar. Gallup’s US Economic Confidence Index is the average of two components: how Americans rate current economic conditions and whether they feel the economy is improving or getting worse. And that is where the bigger problem lies; ‘hope’ about the future is falling rapidly. Fewer Americans last week said the economy was “getting better” (45%) than said it was “getting worse” (49%), leaving the economic outlook component at -4, its worst score since Trump’s election (during the week of Nov. 7-13), when it measured -5. It is now nearly 20 points below its recent high of +15 set in early March and nine points lower than its average score in the post-election period. Despite record high stocks and recently dropping gas prices and a constant narrative of how fast wages are growing, consumers are losing faith in the Trump miracle. Tax cuts and infrastructure spending are nowhere in sight. In my mind, the stage has been set: lots of unfilled gaps, record low volatility, declining data and falling confidence add up to serious fragility in the markets. In my experience, when markets are unusually quiet they are preparing for a major move. Aren’t you better off on the sidelines dear reader? Previous Previous post: Is China Now Rolling in Reverse?